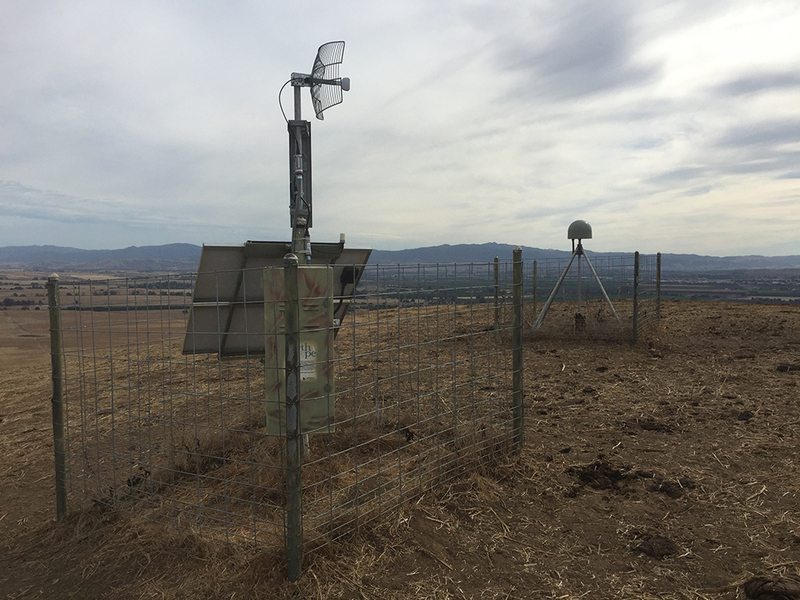 Collecting continuous GNSS data requires enormous investments in planning, hardware, and physical effort. 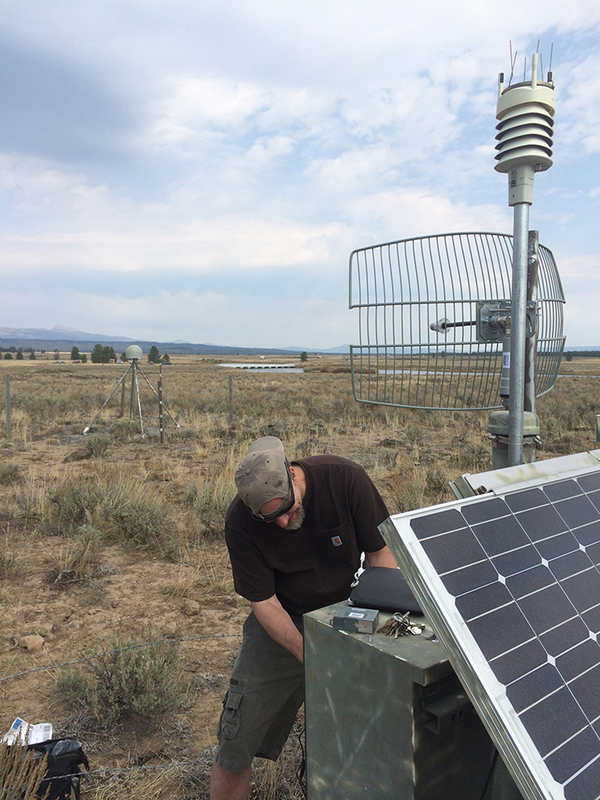 Getting those data back to a central repository for distribution as quickly and reliably as possible presents even more challenges. 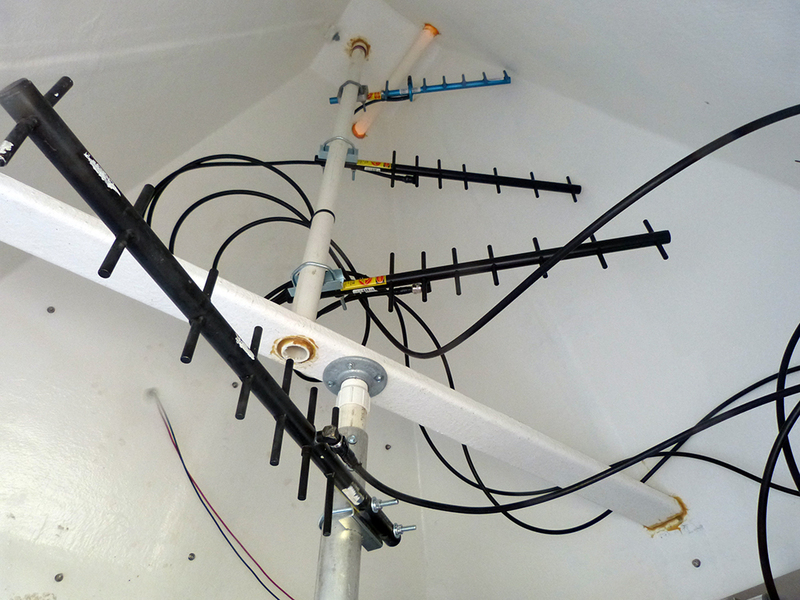 Strategies range from cellular modems to satellite communications, and from local internet providers to multipoint radio networks spanning hundreds of square miles and a dozen stations. 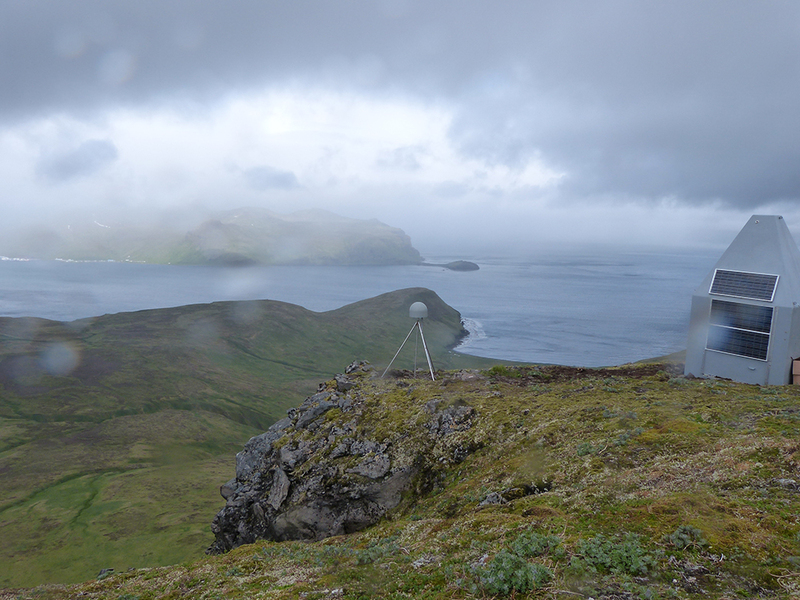 Here, we highlight ongoing efforts to improve reliability and performance as well as expand capabilities by creating and upgrading these multipoint radio networks throughout the Plate Boundary Observatory. In particular, engineers in the Alaska, East, Pacific Northwest, and Southwest regions each share a noteworthy radio networking project. 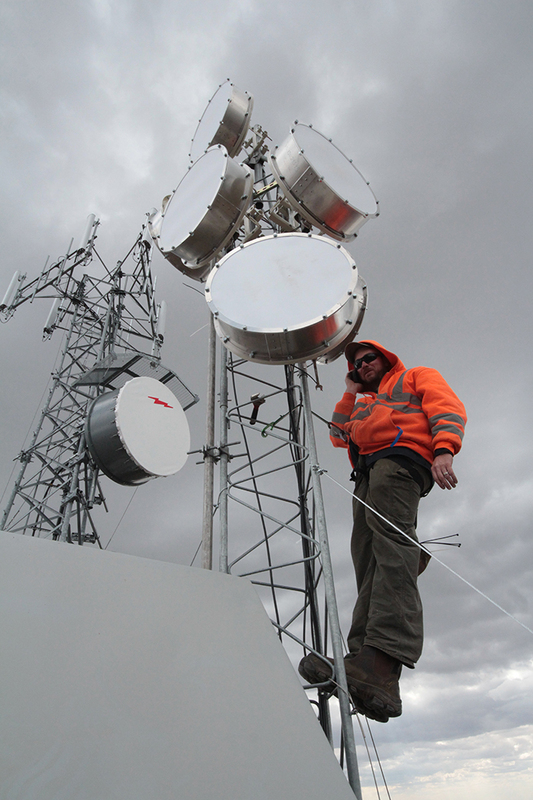 As the needs of the community evolve, so must the capabilities of the network. 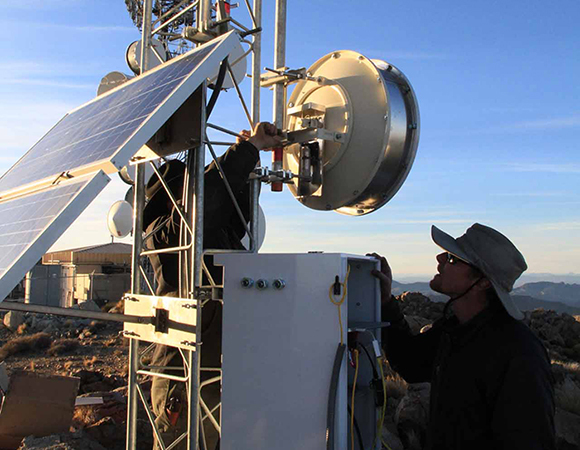 In 2008, when the Plate Boundary Observatory was completed, the majority of stations had transfer rates of less than 15kB/s over first-generation cellular modems and Ethernet radios. Since the installation phase, there has been an increasing demand for high-rate data to examine co-seismic processes and for real-time streams to contribute to earthquake early warning systems – the communications standards of a decade ago simply can’t keep up. 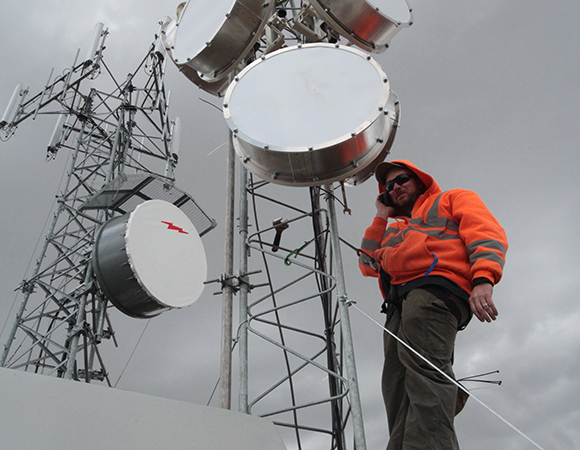 Thankfully, options for transmitting data wirelessly have grown enormously since the completion of the network and upgrading these systems with modern internet gateways and radios allows transfer rate increases up to a hundredfold. 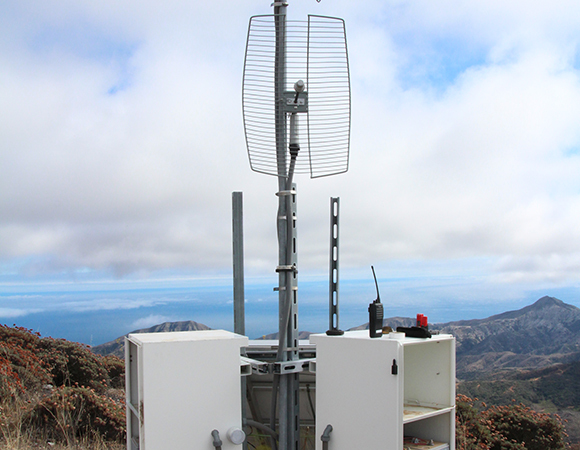 This not only enables better stability and state-of-health monitoring but new science as well. 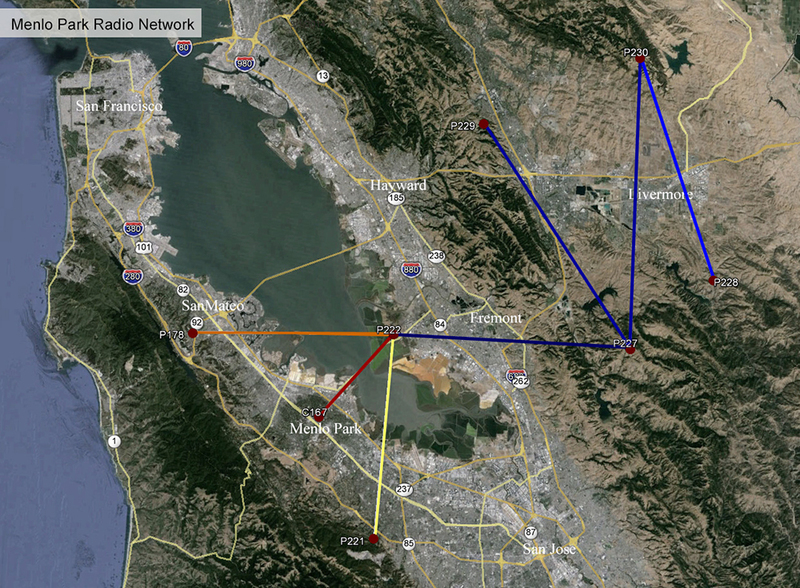 Within the publically available airspace, greater bandwidth requires higher frequencies (5.8GHz versus 900MHz) and higher frequencies require better line-of-sight between stations. 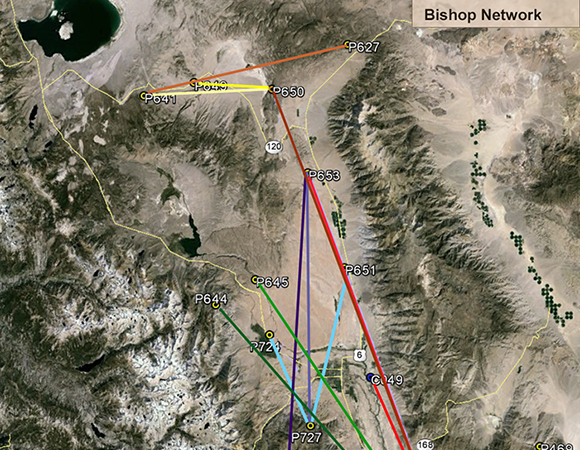 This means that not all links can be easily upgraded. At the same time, more of the available bandwidth is being used by private individuals and wireless internet service providers. 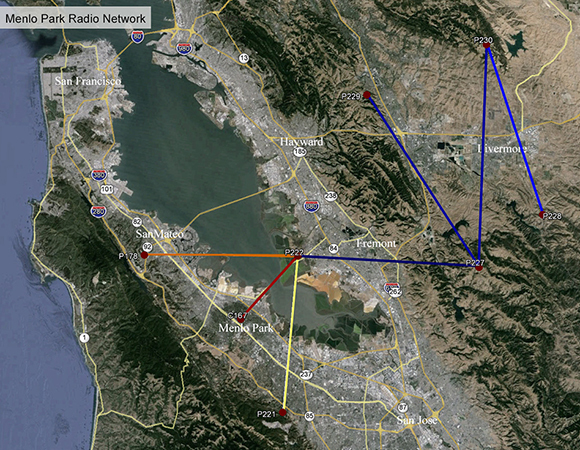 This has the effect of reducing hardware costs but also of crowding the airspace. 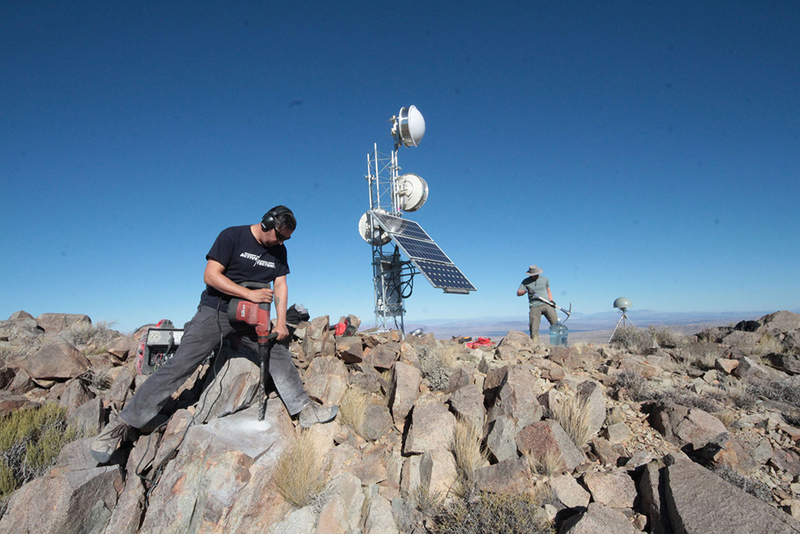 Field engineers employ various techniques for overcoming these obstacles such as armoring higher-gain, highly directional antennas, adapting to different environments using different radios and frequency ranges, and using comms-only repeater stations to get signals back from distant sites. 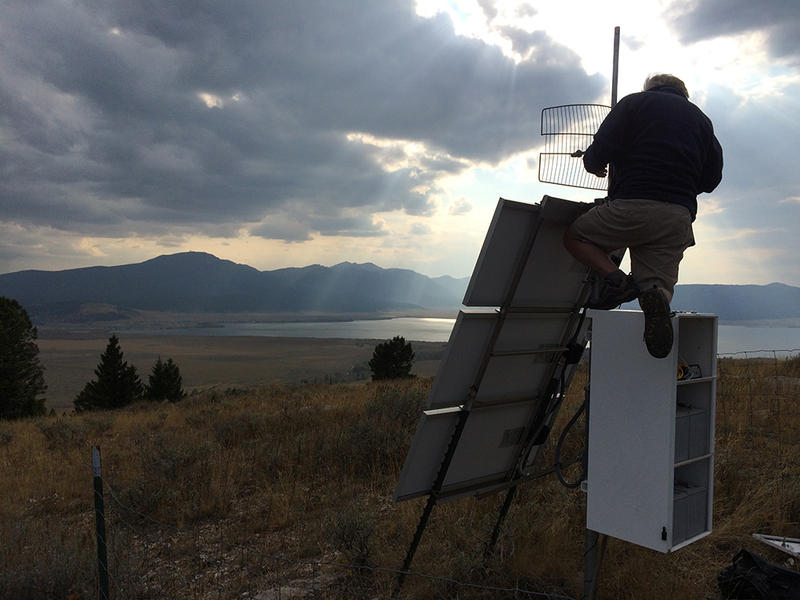 While we can plan for most of the technical challenges, working in the field, often far from civilization, frequently presents less predictable obstacles. 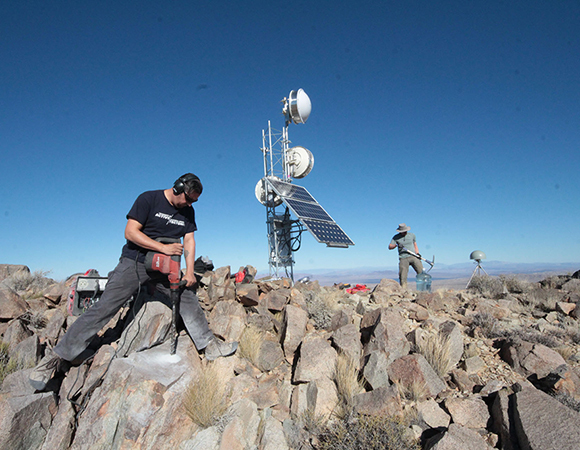 Field engineers might easily find themselves in white-out snow conditions on the side of an active volcano, hoping their helicopter pilot can find a break in the clouds to collect them; or jacking up a 6-ton truck in 113-degree heat in the middle of the Mojave desert so they can dig their wheels out of a sandy wash and reach their objective. 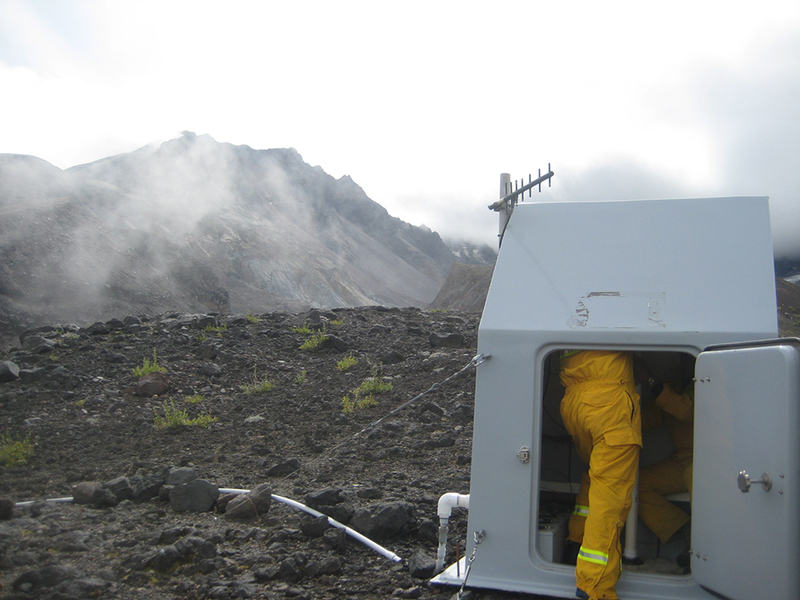 Radio networking is a crucial tool for data retrieval in the Alaska region. 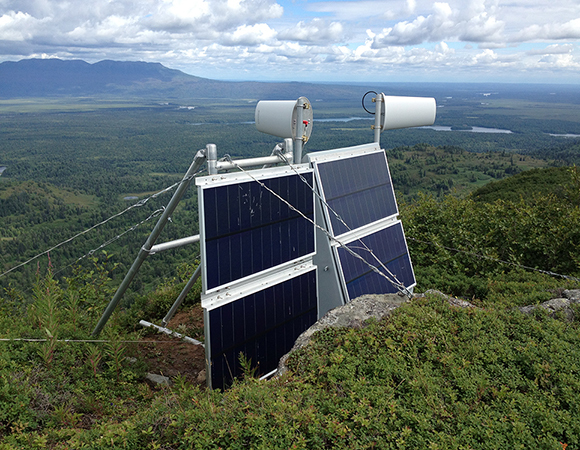 Of the 140 PBO GPS stations in Alaska, 60 percent (85 total) are linked by 900 MHz radios to some other type of telemetry hub upstream. 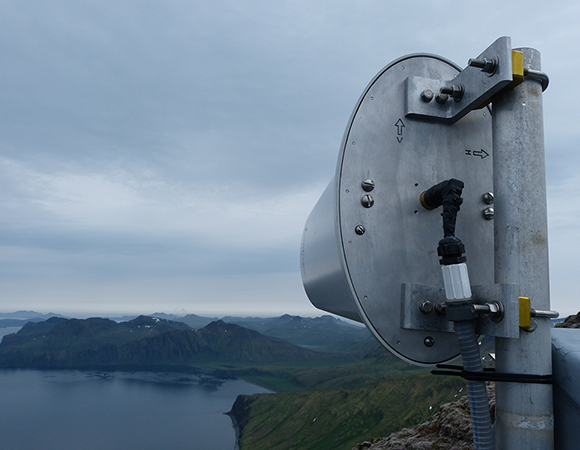 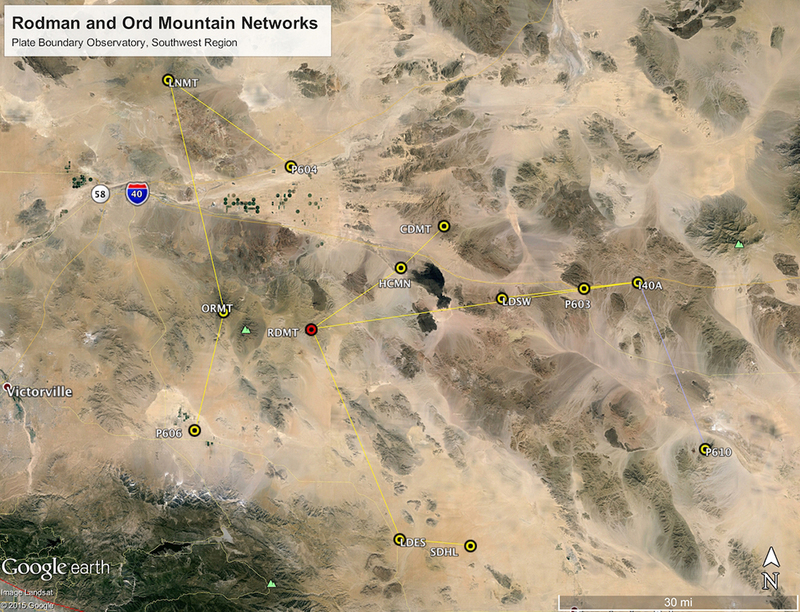 Another 43 sites (3 GPS stations and the 40 PBO-AK communications-only stations) serve to receive or repeat these radio links to endpoint telemetry, which may consist of a satellite uplink, cell modem, or DSL connection. 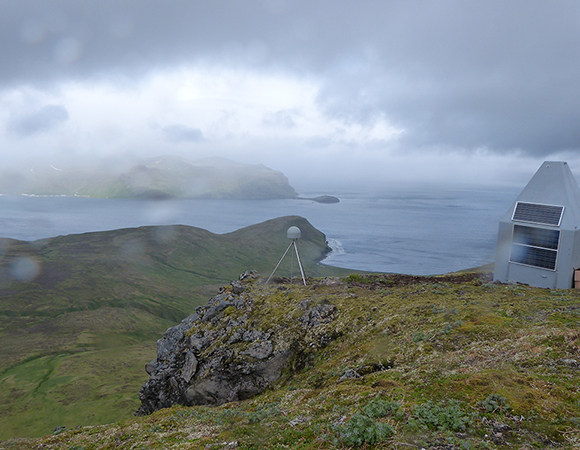 Critical radio work completed during the 2015 field season was upgrading our high-speed back-haul links from Unimak Island into the village of Cold Bay on the Alaska Peninsula. 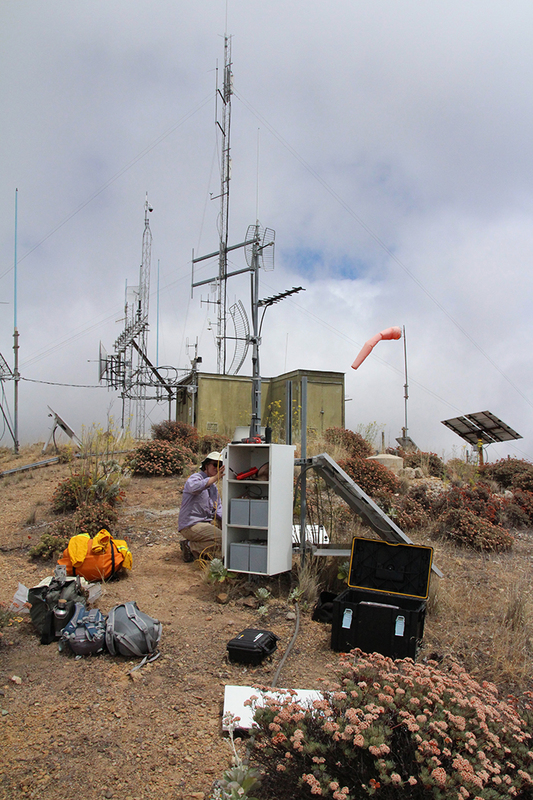 These links transmit data from volcano monitoring equipment including 6 GPS stations, 4 tiltmeters and 3 broadband seismometers. 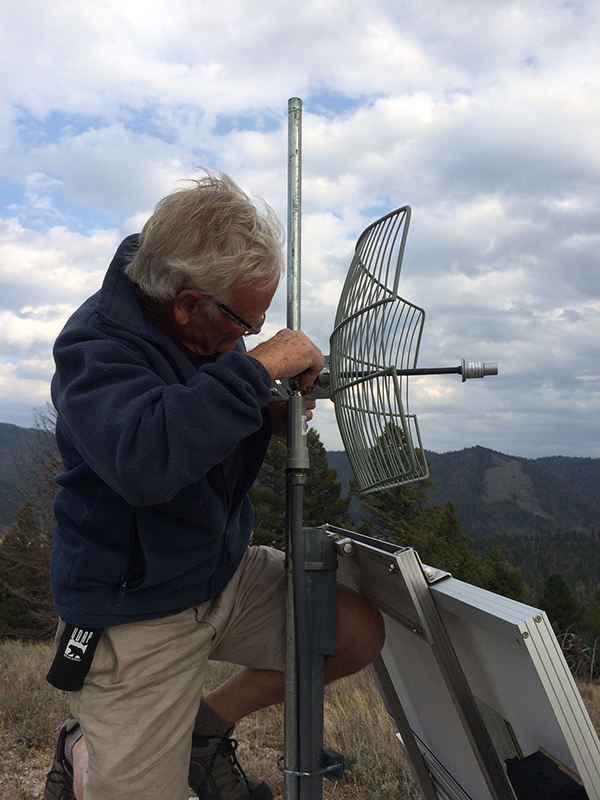 In September 2015, UNAVCO engineers performed upgrades to the Sawtell radio network in the Greater Yellowstone Basin. 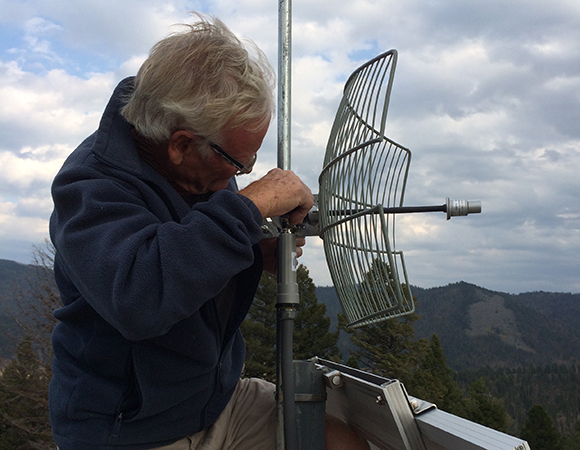 Five sites were upgraded to 5.8 GHz radios, while three more upgrades were postponed due to weather conditions. 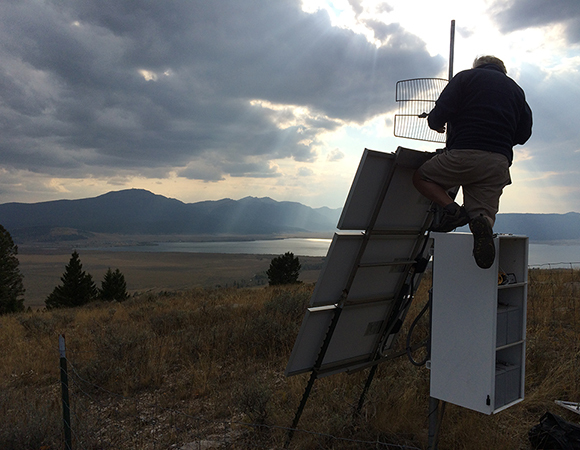 These stations are on the western side of Yellowstone National Park and are used to help monitor uplift and subsidence (up to ~7cm/yr) of the nearby Yellowstone Caldera as well as constrain the Hebgen Lake fault and potential associated seismicity. 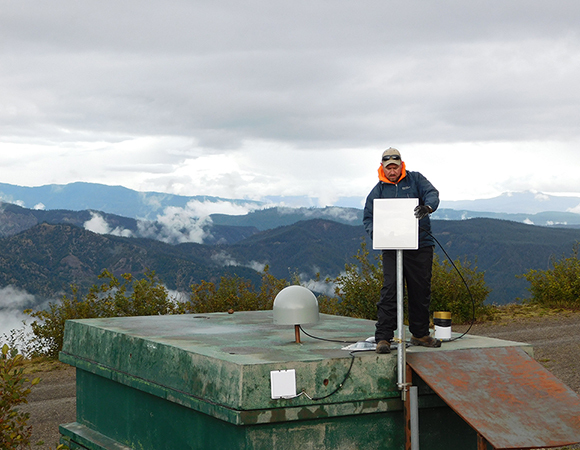 The Pacific Northwest Region relies on radios for 30% of GPS station telemetry. 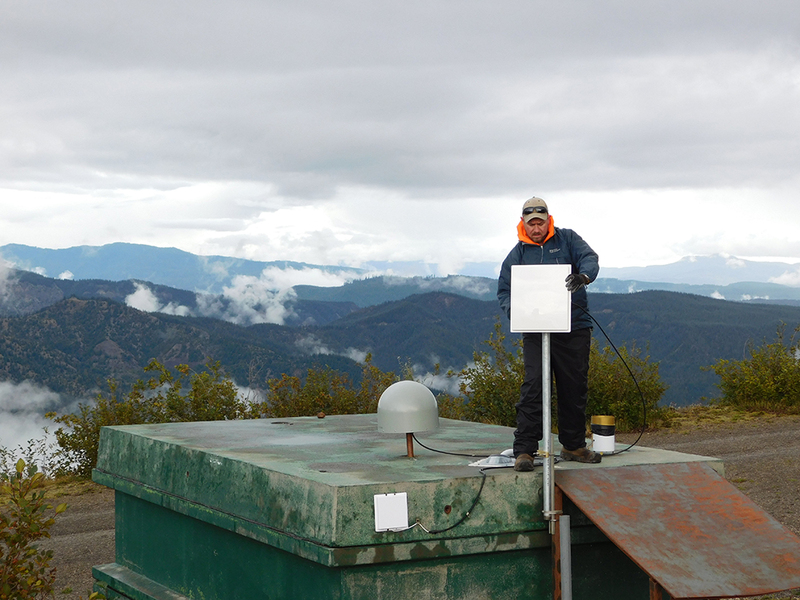 Due to poor cell coverage and expansive geography in the Pacific Northwest it would not be possible to maintain 270 real-time GPS stations any other way. 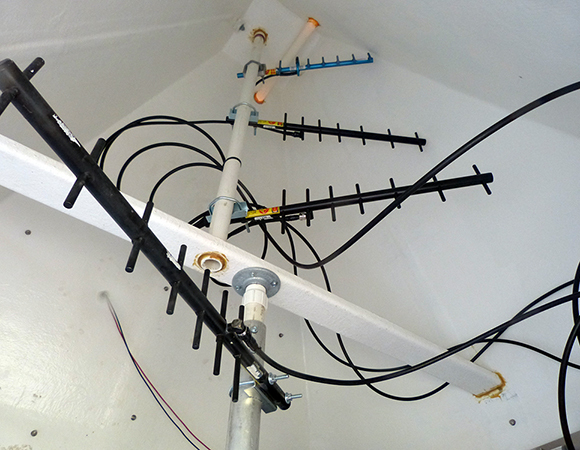 In some cases we have as many as 10-12 stations operating through one internet connection, making for a highly cost-effective network. 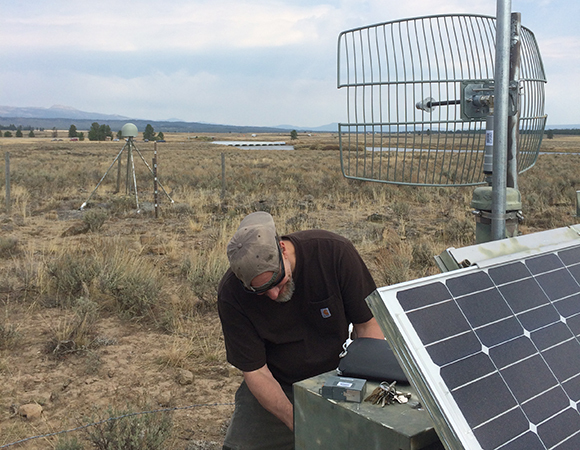 We are constantly scouting, planning and deploying new radio networks to continue to lower costs of telemetry and maintenance, and to strengthen the existing infrastructure. 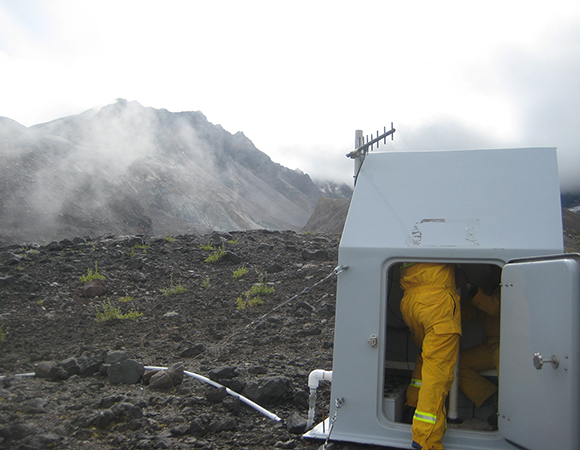 Recent work has been done at sites on Mount St. Helens and in the Steens Wilderness. 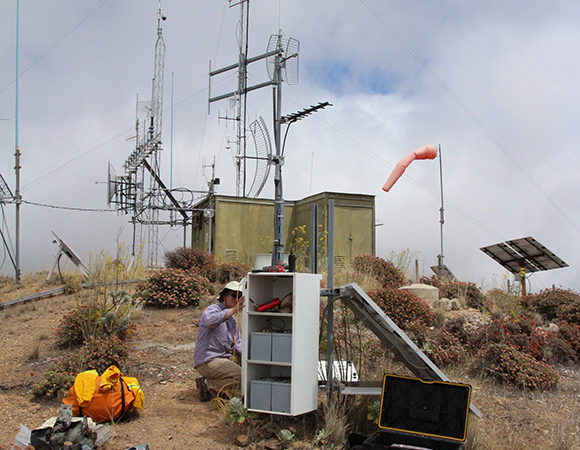 Many stations in the Southwest Region have been on radio networks since the very early days of the PBO project. 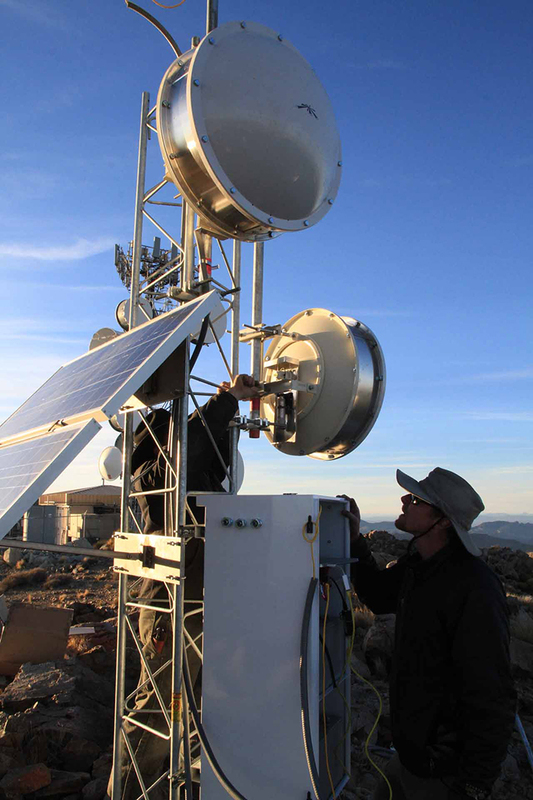 Other sites were planned with radio networking in mind but limited time and resources have made deployment heretofore impossible to execute. 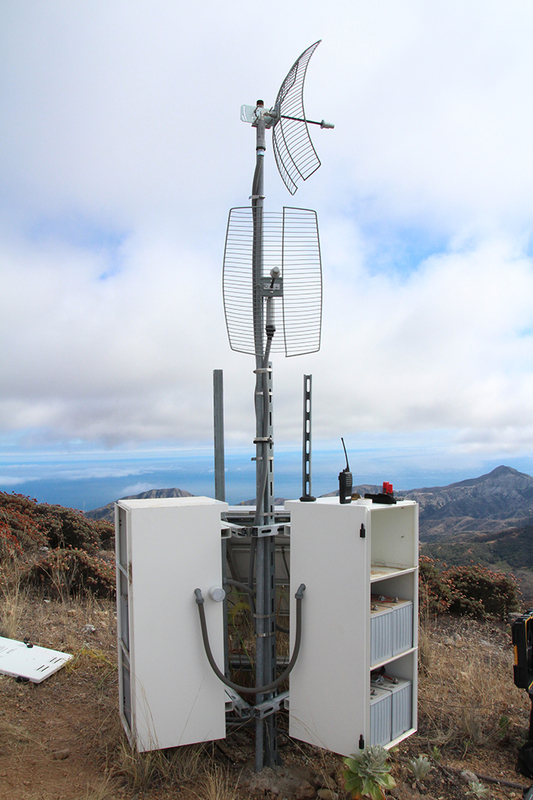 Recent projects include (but are not limited to) radio upgrades in the Channel Islands, Bishop, and the Menlo area, and creation of new radio networks in the area of Hollister, CA, Rodman Mountain, and Ord Mountain.